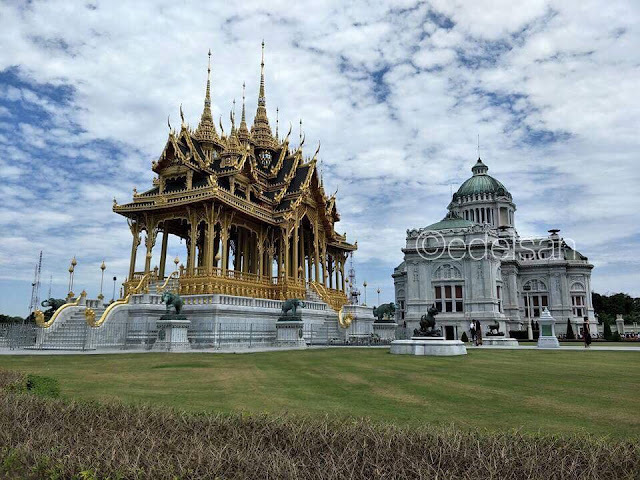 The first time I saw Ananta Samakhom Throne Hall was in August 2015 when I went to Bangkok, Thailand as part of the Air Asia Travel Photographer 2015 competition. Although we visited the Grand Palace, and entrance ticket includes free entrance to the Throne Hall, we weren't able to do so because we spent a lot of time at the nearby Wat Benchamabophit. 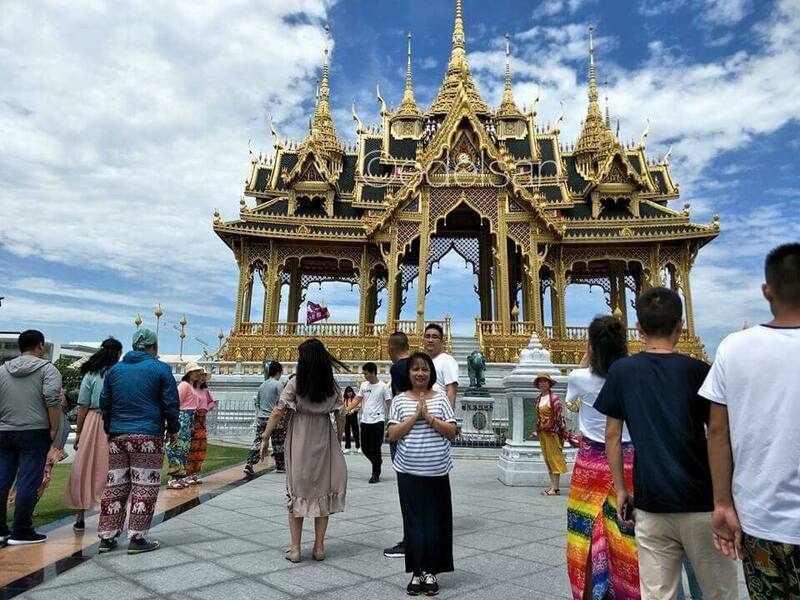 The photo below was my first glimpse of Ananta Samakhom and it looked so majestic. I wasn't expecting to see anything like it in Bangkok that I promised myself that I will include it on my next trip. 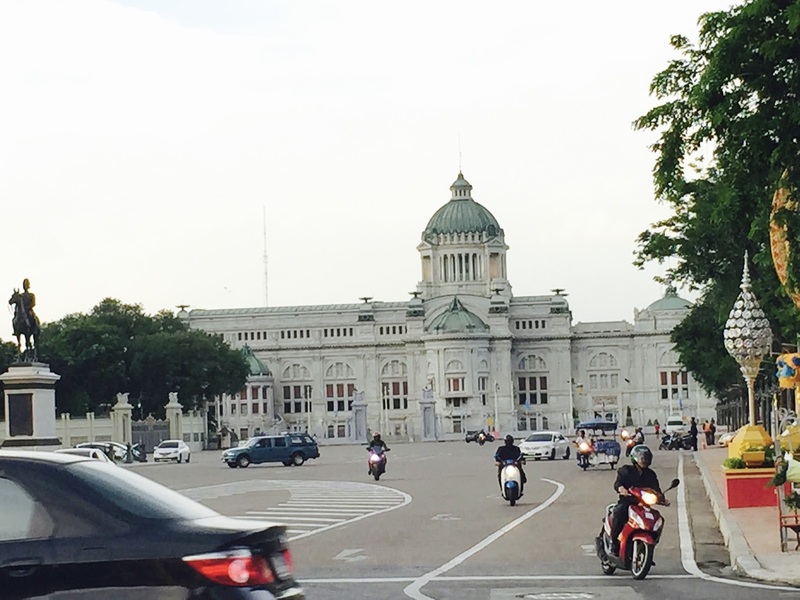 Upon entering the throne hall grounds, expect a walk of about a kilometer from the gate up to the ticket office. But before that, you'll see first the golden Memorial Crowns of the Auspice. 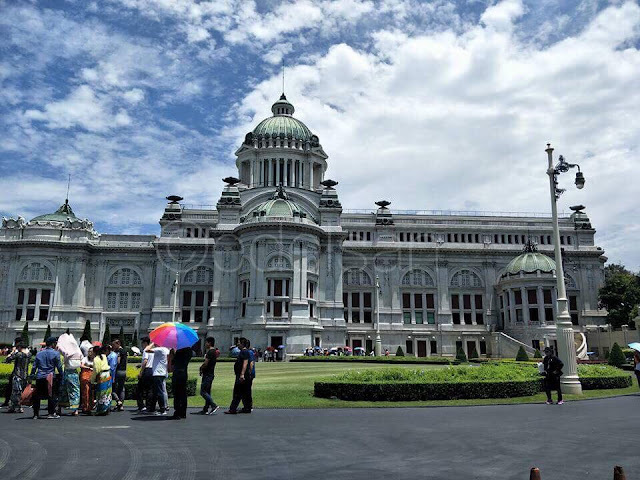 Ananta Samakhom is a two-storey building with a huge dome. I have not seen the actual St. Peter's Basilica in Rome but that's what comes to mind when I saw Ananta Samakhom up close. Before entering the throne hall, one needs to buy a ticket inside. If you are traveling alone or just with some friends, you just go directly to the ticket office. Also, please bear in mind that proper attire is required to enter the premises. Men should wear closed shoes, and pants, and collared shirts. Wearing shorts or t-shirts is definitely a no-no. For the ladies, no pants and sleeveless or off shoulders. Long dresses and skirt is required (ankle length). And be ready to get inspected once you buy your ticket. If what you are wearing didn't pass inspection, you can rent some sarong or buy one. I was wearing flare pants that time so I was told to rent or buy a sarong. I opted to buy one. However, you can also bring shawl or your own sarong. Also, you can't bring anything inside such as cameras or mobile phones. Don't fret though, there's a free locker in the ticket area. 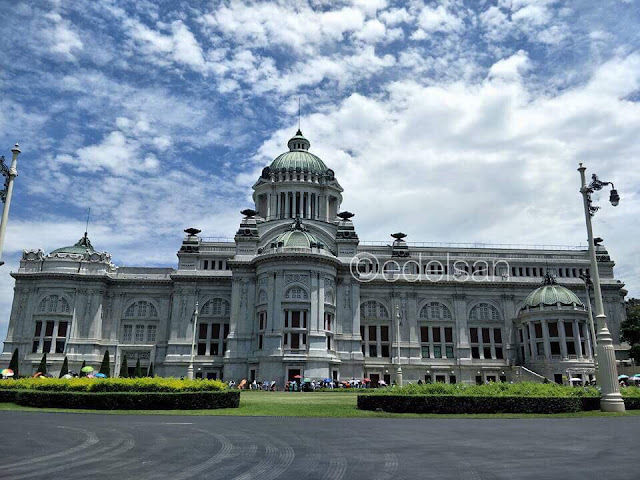 Then expect to be frisked upon entering the throne hall. If you don't have a guide with you, ask for the "audio" guide which you can get before going up. The audio guide is available in several languages and just in case you can't figure out how to use it, there are many docents around to assist you. 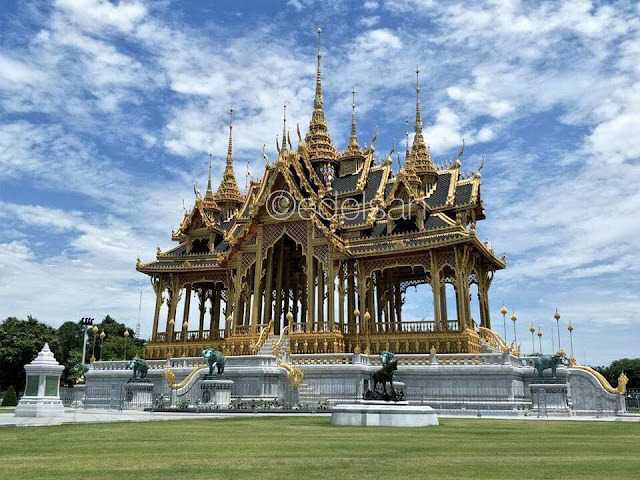 The building housed some royal chariots, thrones and palanquins, most of which are centuries old and have been used by former kings of Thailand. The dome and walls depict scenes from the Chakri Dynasty, with two huge ones covering the wall and made from the famous Thai silk. The chariots are also huge and golden, and some of the palanquins are made from teak wood. 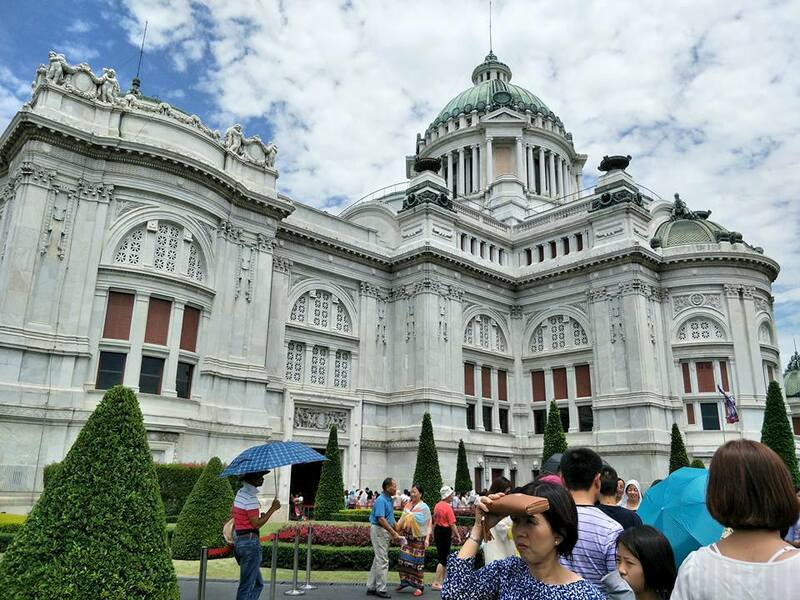 I was left speechless upon seeing the grandiosity of what's inside the throne hall. I've never seen anything like it especially the frescoes on the dome. It was so magnificent that it made me wonder if I'd have the same feeling if I went to St. Peter's Basilica or any palace in Europe. And if you feel sad about not being able to take pictures inside the throne hall, don't worry because there's a small shop inside where you can buy souvenirs. Here's me, doing the popular tourist "pose" in front of the Memorial Crowns of the Auspice.